Win a pair of 2012 men's or women's Lunar Vapor tennis shoes! 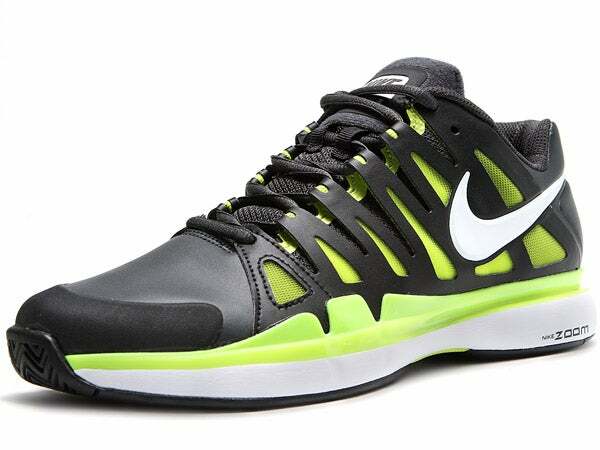 You are here: Home / Announcements / Win these Nike tennis shoes! Win these Nike tennis shoes! I can’t believe that it’s that time already, it’s the time where I give away some free tennis stuff to one lucky reader! If you remember, I do contests for every major tennis tournament (Australian Open, French Open, Wimbledon, and the US Open), last time around one lucky winner won a brand new 2012 Wilson BLX ProStaff Six.One 90 (Roger Federer’s tennis racquet of choice). For the 2012 French Open, I have been thinking what to offer my favorite people…I decided on a pair of new Nike tennis shoes! Yep, Nike tennis shoes…for free! The shoe of choice for Roger Federer, the Lunar Vapor 9 Tour offers a new look and feel while maintaining the Vapor line’s integrity with a light weight, supportive fit for high level performance. Well known Nike designer, Tinker Hatfield (google it), was lead designer for this latest version of Vapor. Designed with running in mind, Nike incorporates Adaptive Fit technology for the ultimate in fit, optimizing foot stability in a light weight fashion while increasing forefoot flexibility. A Cushlon midsole with Zoom Air in the heel provide comfortable cushion while keeping a low to the ground feel. The XDR outsole with herringbone pattern keeps traction and durability at a performance level for all court surfaces. Flex grooves in the outsole help promote faster movement, allowing shoe flexion in conjunction with the feet while aiding in greater court surface traction for maximum tack. This improved Vapor continues its heritage by offering the ultimate in lightweight comfortable performance. Now, I can’t just offer a free pair of Nike tennis shoes for only the men, I am also be including the lovely tennis ladies of the world, in this contest, I will also be offering a pair of 2012 Nike Lunar Speed 3 White/Scarlet tennis shoes! This is the shoe of choice for Maria Sharapova, so you know it’s a good choice. It’s all about moving quickly on court as Nike continues its Lunar series for women with the Lunar Speed 3. Built with an internal fit system that hugs the foot, the shoe provides an exceptional fit, and a carbon fiber shank provides lightweight support. Additional support is provided by the nylon wires of the Flywire system in the upper. Add those aspects to an extremely low-to-the-ground ride from the Lunarlon cushioning, and this shoe delivers speed on the court. This version features a more accomodating fit than previous versions with a widened forefoot and deeper toebox. Always stylish, the Lunar Speed 3 will appeal to the competitive player who craves the ultimate in lightweight performance. Now for all the juicy detail for winning these awesome Nike tennis shoes; this contest starts May 2nd, 2012 and will continue through to the end of the French Open (June 10th, 2012), only 1 winner will be selected (woman or man, NOT one of each). I will contact the winner privately and will announce the winner after I have received confirmation of that winner. Winner will have 24 hours to respond to my email, if no response received within 24 hours, another winner will be selected. If an international winner is selected, that winner agrees to pay for international shipping (sorry, I’m not made of money!). How to enter, same way as always…leave a comment below. The comment should include one of your fondest memories from any French Open in history, man or woman. I wish you luck and encourage you to sign up for my newsletter where you can be in the loop of future giveaways and all things tennis! When Soderling beat Rafa on clay seems so hard these days!! Agassi/Courier — 1991 was the best!!! Def Nadal/Federer 2005 for Me!On the day of his 19th birthday, Rafael Nadal inaugurated one of sport’s greatest rivalries when he beat Roger Federer 6-3, 4-6, 6-4, 6-3 in a gripping semi-final match. The elements of the rivalry appeared in incipient form: the supremacy of Nadal’s defensive play (Federer lost despite coming to the net 59 times) and Federer’s mental fragility in the face of his opponent’s imperviousness (during the match, Federer howled with frustration and even banged the side of his head with his racket strings). Nadal went on to win the championship — his first of four in a row; the next three all came with victories over Federer in the final. chair to look at the mark and ruled against him. Kuerten was furious. sets ever played in a Grand Slam tournament with the crowd going wild. Their hero had won. After that Norman disappeared back into obscurity. act in his fourth round match in which he saved match points. My most fond memory from French Open History would have to be the upset that Robin Soderling acheived in 2009 against Rafael Nadal. This was the first time I was introduced to Soderling and since then he has become my favorite player, so it was awesome to see him triumph! my fondest memory was in The 2004 French Open Men’s final. Guillermo Coria vs. Gaston Gaudio. has 2 match points just barely hitting shots out on both points. Richard krajicek getting onbhis knees, when winning his first and only gram slam on the famous grass of wimbledon! Pundits focused on what records were being equaled and what the win meant for Federer’s legacy, but something much more salient was on display there: love for the Game. Federer, fantastically successful in life by the ripe age of 27, didn’t want to settle for anything less than a win in Paris. No matter how many times Nadal beat him back, Federer returned to try, again and again. His perseverance paid off. Some people call that Love. I just remember reading about Rene Lacoste and thinking he was small for a major athlete. That is when I decided that learning good technique must be pretty important to the sport of tennis. Agassi completing his career grand slam after being two sets down! Serena Williams beating Venus in the final for her only FO title. Agassi’s CAREER SLAM!, but still fresh on my mind was Li Na’s win against Sciavonne. Li Na just puts a smile on my face with her brilliant hard strokes and her tenacity. Her personality is uplifting in a sport filled with arrogant, less courteous ladies(?) Watching her win and reading about her heroism celebrated in China are great memories. Let’s hope the French Open 2012 is just as eventful! Thanks for your generosity!!! You’re too cool. Watching Andre Agassi complete his career slam at the French. The best moment of Roland garros was michael Chang vs ivan Lendl, but I don’t remember the year. It was 5 setter, when the last game Chang had a cramp but still won the grand slam with his under serve. Roger Federer inflicting Novak Djokovic with his first defeat in 2011. My fondest memory was when I was five and I first saw Rafael play. It was the first time I had ever watched tennis. It was amazing and inspired me to begin playing. I haven’t put down a racket since. Watching that match led me to play tennis, probably the best thing that has ever happened in my life. I love tennis. I think my fondest memory is when Mats Wilander as a youngster won the final. My fondest memory is watching Roger Federer who has the grace of Borg battling Raphael Nadal on the clay courts of Rolland Garros last year playing their hearts out as these two champions battle. I am amazed of how Rafa slides on the courts with his speed and accuracy. my favorite moments in French Open histories rather is when Nadal is the chamion……oh way, he was champion for FO many times. haha. i wanna win!!!!! In December of 2008, my junior year of high school, I was diagnosed with Type I Diabetes, and as the New Year started many things in my life changed. One thing in my life has always remained the same is my appreciation and love for Roger Federer as a tennis player. I am currently a college tennis player in southern California, and continue to be a die-hard fan to this day. Having modeled my game off of Roger’s with a platform serve, one-handed backhand, and semi-western forehand grip, I have always considered Roger to be my idol. The first grand slam tournament I watched Roger play after my diagnosis, ended in a crushing, five-set defeat to Rafael Nadal at the 2009 Australian Open in a tournament I really wish he would have won. My favorite French Open memory comes in 2009, when I watched Roger take out Soderling to win his first and only French Open title. This match marked a turning point in my life, and watching Roger come back from behind against two incredible players, Tommy Haas in the quarterfinals and Juan Martin Del Potro in the semi-finals to storm to his first French Open title really inspired me to do what others thought I could not. I ended my junior year being ranked in the top 200 in Northern California and proceeded to finish my senior year as a top 50 player in my section, as well as, being selected as second team all EBAL (East Bay Athletic League), becoming a nationally ranked player in the 18s, and moving on to play college tennis. I will never forget my memories of the 2009 French Open, and I will always stand by that grand slam being by far my favorite event played. Roger proved everyone wrong and inspired me in route to his 14th grand slam title and his first French Open victory!Thanks for reading my story and I hope to be picked as the contest winner! 1999 final between Agassi and Medvedev. His only French title, won it in a dramatic fashion, what a comeback! Henman reaching the semis in 04, on his worst surface. FO 2009, 4th Rd. Sod vs Nad. Soderling fearless. Crushing groundstrokes. The final 1999, Graf vs. Hingis, where Hingis didnt wanna show up for the trophy ceremony. 1891 ▪ THE VERY FIRST TOURNAMENT ▪ H. Briggs won the title against P. Baigneres with 6-3 6-2.